Jakarta – PT. Toyota Motor Manufacturing Indonesia (TMMIN) today celebrates the start of the All New Kijang Innova mass production in a Line-Off Ceremony held in TMMIN Karawang Plant 1 at Karawang - West Java. The Ceremony is attended by Minister of Industry of the Republic of Indonesia Saleh Husin, Toyota Motor Corporation (TMC) Executive Vice President Seiichi Sudo, PT. Toyota-Astra Motor (TAM) President Director and TMC Managing Officer Hiroyuki Fukui, TMMIN President Director Masahiro Nonami, and TMMIN Vice President Director Warih Andang Tjahjono. TMMIN Karawang Plant 1 is the first plant in the world to start production of the All New Kijang Innova. “We are very happy to share with you the All New Kijang Innova as evidence of our strong and continuous commitment to produce cars that suited the needs of Indonesians. This celebration would not be possible without the cooperation from our partner TAM, local suppliers, dealers, and many more as well as the tremendous support from the Government and the people of Indonesia,” said TMMIN President Director M. Nonami in his greeting. The All New Kijang Innova is the sixth generation of legendary Kijang model which started its first production in Indonesia on 1977. 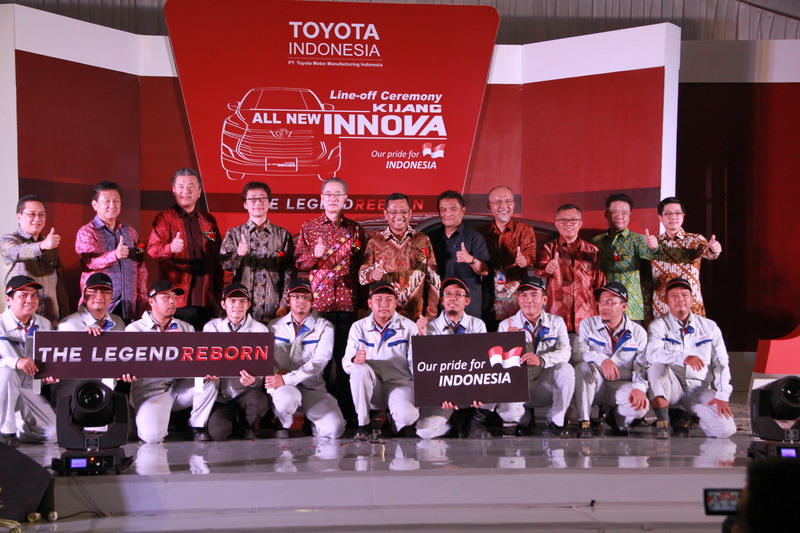 Starting with a local content of 19 percent in the first generation, this generation boasts an Indonesia local content of 85 percent, steadily increasing the involvement of Indonesian human resources in both Toyota Indonesia and local suppliers. 16 new local suppliers are added due to production of the All New Kijang Innova, making the number of TMMIN first tier local suppliers to 123 companies. TMMIN has been carrying out a close partnership with local suppliers to be able to continuously grow and improve quality to meet the needs of customers and be competitive. A special function in TMMIN is dedicated to handle the issue of supplier development from skill transfer, standards of safety, quality, efficiency and delivery to management function. Now TMMIN is embracing first tier suppliers to transfer this knowledge to their suppliers and so forth to create domino effects. “Today is not all about celebration; it is also a reminder for us to continue our best efforts in contributing to the development of Indonesia automotive industry,” explains Nonami. DNA of Kijang model was adopted into the IMV project starting from its fifth generation back in 2004, adding the global name “Innova” to the Kijang. The global platform enjoyed by Kijang Innova since then has resulted in a bigger access to global market which reflected on the significant increase in TMMIN export performance. Kijang model is the first Completely Built Up vehicle exported by Toyota Indonesia in 1987 starting with a volume of approximately 500 units annually to countries in Asia and Pacific region. Now, Kijang Innova has become one of the backbones of Toyota Indonesia export; reaching an average of 16,000 units exported annually in the past 5 years to countries in Asia, Pacific, Africa, Latin America, the Middle East, and Caribbean. Last year, export of CBU Toyota model from Indonesia reached 160,000 units, more than 80% share from Indonesia total vehicle export. On top of producing the All New Kijang Innova, TMMIN also produces the latest gasoline engine, TR-Kai, as powertrain. The new gasoline engine is produce at TMMIN Sunter 1 Plant in North Jakarta. Similar with the Kijang Innova, TMMIN also export gasoline engine with an average volume of more than 45,000 units annually in the past 5 years. Toyota Indonesia is a firm believer of the philosophy “We make People before We Make Product” as the core value of our company. This is the foundation of the continuous development of human resources in Toyota Indonesia and for Toyota Indonesia suppliers. “Without global quality human resources we would not be able to maintain and continuously improve our world class standard products. For the development of All New Kijang Innova, 150 of our engineers are involved in every stage together with their global counterparts,” said TMMIN Vice President Director Warih Andang Tjahjono. Various people development activities are held to further improve skills, knowledge, and capabilities of Toyota Indonesia employees. These activities are supported by training centers called Toyota Learning Center (TLC) that can too be used by Toyota suppliers and vocational schools around Toyota Indonesia premises. Member of Toyota Indonesia also actively participate in skill contest at domestic, regional, and global level. In August 2015, Toyota Indonesia’s members won silver and bronze medal at the 43rd WorldSkills Competition, adding to previous achievement of 2 silver medals won.